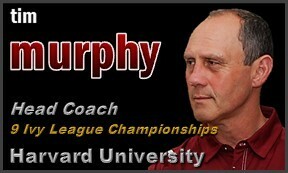 Murphy was named head football coach at Harvard Dec. 6, 1993. He came from the University of Cincinnati, where that fall he had directed the Division I-A Bearcats to their finest record in 17 years. Murphy's first head coaching position was at the University of Maine, where, in 1987, he led the Black Bears to their first NCAA Division I-AA playoff berth. By any measure, Tim Murphy has led Harvard's storied football program to its most prosperous era since the early 20th century. He completed his 24th season as the Thomas Stephenson Family Head Coach for Harvard Football in 2017. One of the game's finest teachers and motivators over the last quarter-century, Murphy is Harvard’s all-time winningest coach, and since the formation of the Ivy League in 1956, only one Ivy coach, Carmen Cozza (179), has more wins than his 163. His Harvard teams have captured nine Ivy League championships (1997, 2001, ’04, ’07, ’08, ’11, '13, '14, '15) and have combined to own the NCAA Division I Football Championship Subdivision’s best record over the last 16 seasons (130-29, .818). Murphy is the first Harvard coach since the iconic Percy Haughton to lead the Crimson to three unbeaten, untied seasons in his tenure (2001, '04, '14). Having previously coached five seasons at Cincinnati and two at Maine, Murphy owns career records of 200-116-1 overall, 168-71 with the Crimson and 17-7 in The Game, the annual rivalry tilt between Harvard and Yale. A seven-time selection as New England Coach of the Year (1988, ’97, 2001, ’04, ’11,'14, '16), Murphy was the American Football Monthly Division I-AA National Coach of the Year in 2004 and was also honored as a finalist for the Eddie Robinson Award for the top FCS coach nationally in 2001, ’04 and ’11. He was the Gridiron Club of Greater Boston Head Coach of the Year in 2001 and ’11 and has also been recognized as the American Football Coaches Association District I Coach of the Year (2001) and the Scotty Whitelaw ECAC Division I-AA Coach of the Year (1997). Murphy was also named the inaugural recipient of the Ivy League Coach of the Year Award in 2014. Under Murphy, Harvard has claimed Ivy titles in six of the last 10 and eight of the last 16 seasons. In those 16 seasons, starting with 2001, the Crimson has posted the third-highest winning percentage in all of NCAA Division I, trailing only Boise State and Ohio State. Harvard has logged at least seven wins in each of those 16 years, an Ivy League record. No other Ivy team has strung together seven such seasons in a row. Every four-year player Murphy has recruited to Harvard has been a part of at least one Ivy League championship team. Murphy is just the fourth head coach to man the Harvard sideline since 1950. Since 1994, Harvard has had 116 first-team All-Ivy League selections, six Ivy Rookies of the Year, nine Ivy Players of the Year, nine first-team All-Americans and 25 players who have been drafted or signed professional contracts, including six-time Pro Bowl center Matt Birk ’98, quarterback Ryan Fitzpatrick ’05 and tight end Cameron Brate '14. In addition, 20 of Murphy’s Harvard players have received national academic recognition (either CoSIDA Academic All-America or the FCS All-Academic Team). Before sending two players to the CoSIDA Academic All-American team in 2008, Harvard had a national-best six players recognized on the All-District 1 team. The Crimson has had 10 or more All-Ivy honorees in each of the last 17 seasons, with program highs of 11 first-team picks and 20 total mentions in 2007 and 2015. He graduated with a Bachelor of Science degree in 1978 and earned a master’s degree in education from Springfield the following year. Murphy did additional postgraduate work at Boston University and was accepted to the J.L. Kellogg Graduate School of Business at Northwestern and the Colgate Darden School of Business at Virginia. Murphy resides in the Boston area with his wife, Martha Kennedy Murphy, and the couple's three children: Molly Kennedy, Conor Timothy and Grace Katharine.